If there's a sound, and it doesn't have a name, is it still a sound? If you have a 'grip' for it, is that a name for it? The naming of sounds is what some call music theory. But I prefer the phrase: learning harmony. It has so many extramusical implications. I've purposely left off the names of some of the chords at the end. Some of them have obvious names. Some less obvious. In particular, that 'grip' that looks like a B7 on beat 4 of Bar 2 in this example? Check the musical notation. That's an Eb. And if this were a bluesy sounding number, with the 'vibe' of the F7 still sounding, I believe you'd hear an Eb there, and not a D#. Assuming that is an Eb and not a D#: What is it called? Does it matter? Have fun naming the other chords, harmony students. 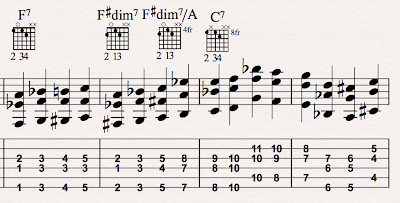 Or if this doesn't interest you: have fun slipping those grips, guitar slingers. Advancing Guitar Lessons: Washington, D.C.
Who Diddley Got Yer Ya Ya's Out?